Organisers said that all ages were expected, but acknowledged that the crowd would lean heavily toward the baby boomers. The festival’s own marketing videos illustrate this, with gray-haired revellers feasting on gourmet food and dancing. 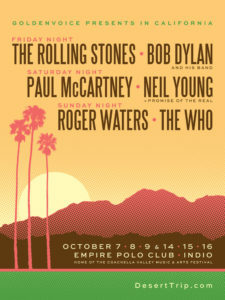 On average, attendees at the Desert Trip festival will spend more than $1,000 each. Satisfying an affluent older crowd became one of the promoters’ main concerns. There is an extensive menu of high-end food, including a $225 four-course meal by chefs like Dominique Ansel and Marcus Samuelsson, and an afternoon-long, all-you-can-eat “culinary experience” for $179. Organisers laboured to ensure an age-friendly experience. For example; minimising patrons’ time waiting in line and providing more than 1,000 flushable toilets. Older fans represent a steady portion of the concert audience, but, as with most areas of business, have been an afterthought for festivals. Let’s hope that successes like this encourage a rethink.